Hitachi cordless screw guns come with a wide range of features. Some of the notable features include an adjustable 2-position handle, inbuilt LED light, reversing trigger switch, multi stage clutch, two speed gearbox, powerful motor, and quick change chuck with bit lock. Let us now look at the pros and cons of Hitachi cordless screw guns. The cordless screw guns from Hitachi are ergonomically designed to reduce user fatigue. They are compact in size and lightweight as well. In fact, a lot of reviews say that you could be deceived by the size and weight when you see the tool for the first time. However, they are quite powerful for their size and are good enough for most household tasks. Thanks to their small size, they can be used in areas where a larger screwdriver cannot fit in easily. The two speed transmission feature is something that all reviewers have mentioned. It can be controlled with a one-touch button and it allows you to do different types of drilling and driving tasks. The torque control is good and helps you avoid stripping screw heads when a screw gets stuck. Most models come with an articulated handle which offers increased comfort and control. Hitachi screw guns deliver an impressive amount of torque. The flash light is bright and illuminates the work space well. The lithium ion batteries that come with these screw guns are of very high quality and last long. As expected, they perform better than Ni-Cad or Ni-MH batteries. The charger is very good and the batteries can be recharged very quickly. The forward/ reverse switch is located conveniently so you can easily switch between tightening and loosening modes without pausing. Most reviewers are of the opinion that Hitachi screw guns are ideal for small household tasks only. Some people feel that the body is too close to the bit and hence it can be difficult to screw/unscrew in tight, confined spaces. The bits often fall off because the chuck does not hold them firmly. This is perhaps the biggest complaint that people have with certain models from Hitachi. Some reviewers feel that the LED feature in Hitachi screw guns is not as good as expected. It has a separate switch and does not turn on when you pull the trigger. These tools are not as rugged and sturdy as most other cordless screw guns available on the market today. So, you should be careful not to drop them too often. 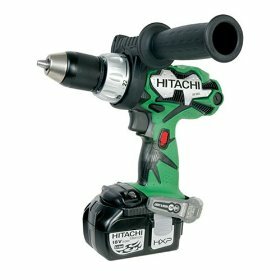 Return From Hitachi Cordless Screw Guns Page to Home - Finishcarpentryhelp.com.